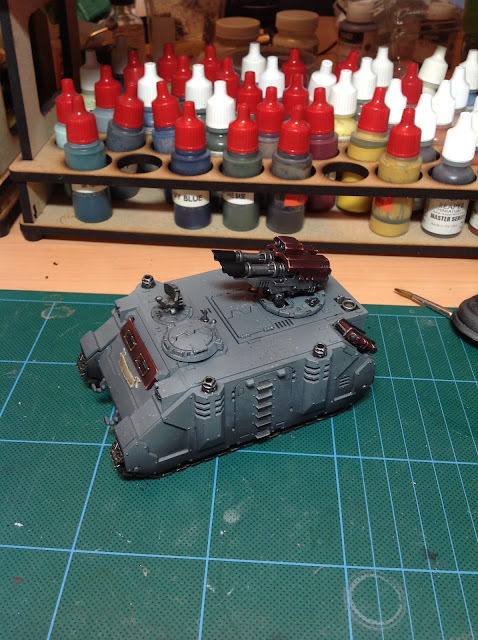 …and the tank is pretty much done! Pete, On the reds, What paints did you use? and How did you get that ‘edgy’ highlight effect? Hi PhillThe reds are a mix of P3, Vallejo Model Colour and Daler Rowney FW black acrylic ink. I started with VMV Black red as a base coat, then washed over it in the thinned ink. This particular Daler Rowney ink dries beautifully matte so gave me a good base to work up from. I edged the gun progressively closer to the corners with progressively lighter colours – VMC Black Red, P3 Sanguine base, P3 Sanguine Highlight, P3 Khador Base, P3 Khador Highlight and then a bright pink for the very corner. Once dry, I glazed it with a GW Bloodletter (?) red glaze.Obviously this could be done in any colour – the knack is the position of the highlights and pushing them to the corners rather than along the whole edge as you get lighter.